This has been an extremely long summer. We have had week after week of temperatures in the 40's and no rain. Many of my types of corn have not survived, or has had a lot of trouble and will not produce much seed. All of the corn has purslane (Portulaca oleracea) growing as a living mulch to keep the soil cooler etc. In some beds this living mulch is well over a foot deep, but it is still not enough when the temperature is so high day and night. 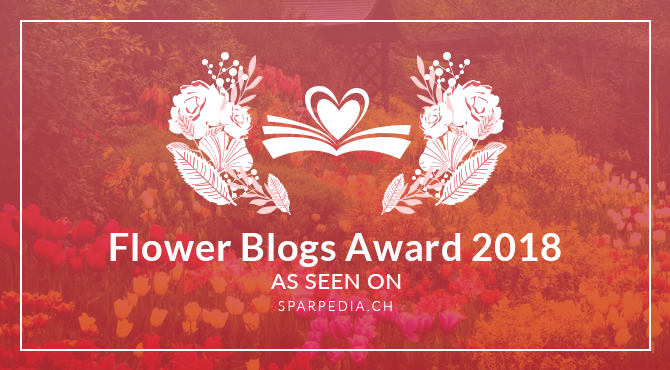 I thought I would write about the progress of a few of the more interesting varieties of corn. I planted all 11 of the precious 'Argent' super sweet white corn seeds that I had. Out of them only 4 grew. As far as seed saving goes that is rather precarious and any small mishap could cause me to lose them all. This has prevented me from eating any argent corn this year as I want as much diversity in the seeds as I can get from such a small number of plants. These plants suffered a lot of damage from the heat but are still growing strong. The plants grew to about 1.5m tall and all are producing several (from 2 to 4) cobs. Unfortunately as I had so few plants these cobs seem to be poorly filled. The timing of the flowering was such that they were shedding pollen when the temperature was over 40C, as a result much of the pollen was denatured by the heat, resulting in few seeds being formed. 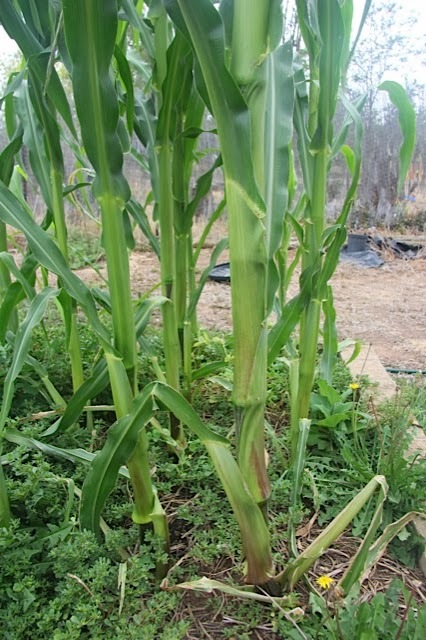 Extreme heat combined with a low number of plants is not good for corn cob formation. Hopefully things go well and I end up with enough seeds between them so that I can do a large growout of this variety next year. With work I should be able to keep this strain going without too much inbreeding depression. If I ever find anyone growing this strain I will try to swap some seeds with them so that I can broaden the gene pool a little. I planted a small number of these seeds (only about 25), and most grew. I have been told that this variety is highly daylight sensitive and it may not produce cobs in my location. 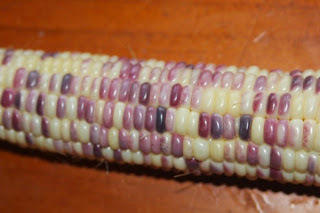 Being a landrace corn there is a lot of genetic diversity. This has grown very tall and thick, some up to 3 metres tall with stalks that are about as thick as my wrist, some are far thicker. Some plants are short and spindly. They seem to be growing roots up the stalk, sometimes 3 or 4 nodes up. Normally this would not seem odd, but when stalks are this tall it means that roots are growing a foot or two above the soil. It has only just started to produce tassels and shed pollen. Unfortunately it has shown no sign of growing any silk and I do not know if it will even attempt to produce any cobs. Even if it does begin to produce cobs I do not know if it will have time to ripen before the first frosts kill the plants. These have also suffered a lot from the relentless heat with many of the higher leaves damaged. This small population has displayed a lot of genetic diversity in terms of growth, hopefully this is enough for it to survive and produce cobs in my climate. These guys pretty much know what they are doing here. While they experienced a little damage from the heat they seem to do a lot better than the other corn varieties. Hopefully it will not be long until this is a good multicoloured pop corn. These suffered badly from the heat but are still growing. They are small plants, maybe some of the taller plants have grown up to a meter, most are shorter than a meter. They have also only just started to grow tassels and have not yet shown any signs of silk or cobs. Many plants have multiple stems so if they do produce cobs there should be a good number of them. Hopefully they have time to produce a crop before the first frost kills them as the kids are keen to pop some blue corn. I grew a decent number of these in the hope of eating most of the cobs as well as saving seed from a good number of plants. They grew from about 1.5 meters with a few up to 2 meters tall. Unfortunately the heat has also damaged these badly. They too have been shedding pollen in 40+ heat and mostly have poorly filled out cobs. It has been a long and hard summer, I am happy that they have even survived as it shows how resilient they are. Some plants produced multiple cobs, but most only produced one. Some of the plants grew multiple stems but this trait does not seem to be too common in this variety. As far as sweet corn goes, this one seems to be a winner. Even though my preference is for white super sweet corn I plan to grow this variety again if I save enough seed. The naturally high level of antioxidants as seen by the blue colouration is a bonus. 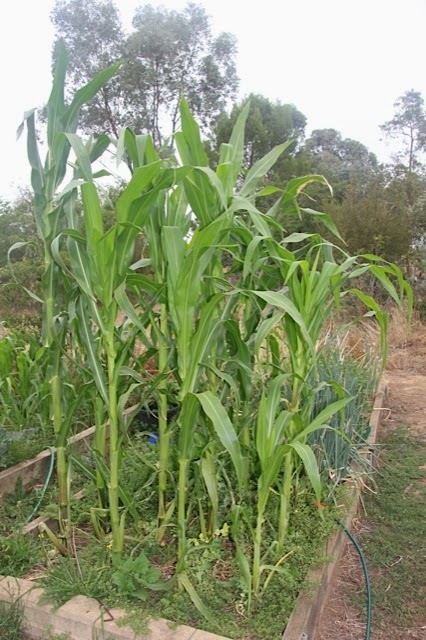 There are not many varieties of coloured sweet corn in Australia so it kind of makes it more important to continue growing it. When they are ready, if I have enough I will try to sell some of these corn varieties through my For Sale page.